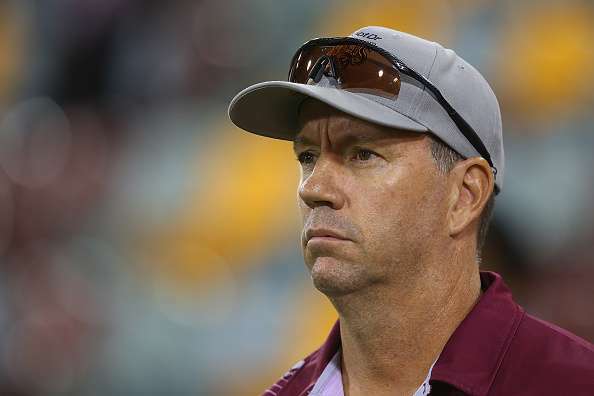 Former Australia cricketer and the current coach of the West Indies cricket team, Stuart Law, has been fined 25% of his match fee for showing dissent at the third umpire Richard Kettleborough’s decision of giving batsman Shane Dowrich out. The incident occurred on the final day of the third Test between the West Indies and Pakistan in Dominica, which the visitors won comfortably by 101 runs. Law was accused of walking into the third umpire’s room after Dowrich’s dismissal, questioning the umpire’s judgment and then using indecent language in the form of inappropriate comments while walking off. Pakistan toured the West Indies for a three-match Test series, which was also the last international series for two of Pakistan’s greatest ever cricketers, Misbah-ul-Haq and Younis Khan. The visitors won the first Test in Kingston, Jamaica by 7 wickets but were beaten fair and square in Bridgetown in the second Test, where they were, rather embarrassingly bowled out for just 81 while chasing a modest total of 188 in their second innings. The third Test was no boring affair either, as a staunch resistance by Roston Chase, who remained unbeaten on 101 brought the Windies on the brink of saving the game while chasing 304 in the fourth innings. However, Yasir Shah snapped Shanon Gabriel, the last man for the hosts, off the final ball of the penultimate over of day 5 to register Pakistan’s first ever Test series win on the Caribbean soil. An ICC statement explained Law’s actions related to the aforementioned incident that occurred in the 44th over of the day when Dowrich was given out caught at short leg by Babar Azam off the bowling of Yasir Shah. The on-field umpire Bruce Oxenford gave the batsman out, but Dowrich, seemingly unsatisfied with the decision, decided to review it. In the absence of the Hotspot and Real Time Snicko technologies, after several replays, the third umpire decided to stick to the on-field decision and upheld Oxenford’s verdict. Visibly miffed at this decision, Law decided to confront the third umpire and had a long chat with him in his room post the dismissal. “The incident happened during the second session's play when, following Shane Dowrich's dismissal, Law visited the third umpire's room, questioned the third umpire for confirming the on-field decision, before leaving the room while making an inappropriate comment,” the ICC statement read. A demerit point has also been added to the 43-year-old’s repertoire that already has one Test and 54 ODIs for Australia. The laws of the game must equally apply to all players as well as the support personnel and irrespective of the seniority or the position held by a veteran of the game, indisciplinary activities must not be left unattended. This isn’t the first incident in recent times when a cricketer has shown dissent towards the third umpire’s decision. On the 1st day of the 4th Test between Pakistan and England at the Oval last year, Alex Hales had stormed into the third umpire’s room after a similar referral had upheld the on-field decision of ‘out’ against him. Being not satisfied with the legitimacy of the catch taken by Yasir Shah at midwicket, Hales had reviewed the decision, only to be given out again by the third umpire Joel Wilson. Hales had used inappropriate language while walking off the field and then stormed into the third umpire’s room to have an argument over the dismissal. The Englishman was fined 15% of his match fee.